Anthurium chiapasense ssp. tlaxiacense (Matuda) Croat, comb. nov.
Anthurium tlaxicacense Matuda, Anales Inst. Biol. Univ. Nac. Mexico 32: 149, Fig. 6. 1961. TYPE: Mexico. Oaxaca: Ccrro de la Virgin, Tiaxiaco (just E of Tlaxiaco); elev. 1,500 m. MacDougali s.n. (MEXU, holotype). Epiphytic or epipetric; stems to 6 cm long, 2 cm diam. ; internodes and leaf scars obscured by cataphylls; roots moderately thick, green; cataphylls subcoriaceous, 6.7-8 cm long, acute at apex (apiculate to 1 mm), drying brown (B & K Yellow 4/5), weathering into coarse fibers, persisting around stem. LEAVES erect-spreading; petioles 37-64 cm long, 6-8 mm diam., ± terete; geniculum 2.5-4 cm long, sometimes weakly sul-cate; blades subcoriaceous, narrowly triangular, 35-56 cm long, 13-30 cm wide, acuminate at apex (apiculate 5 mm), deeply lobed at base, broadest at base; anterior lobe 28-45 cm long, the margins round to convex; posterior lobes 9-12 cm long, directed upward; sinus hippocrepi-form, acute at apex; upper surface matte to semiglossy, lower surface matte, glandular-punctate; midrib flat to convexly raised above, weakly sunken at apex, prominently raised below; basal veins 4-5 pairs, the third to fifth coalesced 1.5 cm, flat to weakly sunken above, raised below; posterior rib naked, turned up; primary lateral veins 5-6 per side, departing midrib at 20°-25° angle, sunken above, raised below, straight to collective vein; lesser veins obscure above, prominulous below; submarginal collective vein usually arising from the uppermost basal vein, 7-9 mm from the margin, sunken above, raised below. INFLORESCENCE spreading-pendent, equalling leaves; peduncle 53-57 cm long, 5-7 mm diam., terete; spathe subcoriaceous, yellow-green (B & K Yellow-green 7/5), lanceolate, 6-7 cm long, 1.5-1.7 cm wide, margins thin, transparent, soon withering, inserted at 40° angle on peduncle; spadix dark yellow-green to gray-green, heavily tinged red-violet at outer margins ofte-pals, 5.5-8.5 cm long, 6-9 mm diam. at base, 3-5 mm diam. at apex; the flowers 4-lobed, 2.3-3 mm long, 2.4-2.8 mm wide, the sides sigmoid; 6-8 flowers visible in the principal spiral, 6-7 flowers visible in the alternate spiral; tepals matte, weakly punctate, densely papillate, lateral tepals 1.3-1.6 mm wide, the inner margin convex; pistil raised, green, glossy; stigma elliptic, 0.4-0.5 mm long, deep purple with large globose droplet ca. 1 week before stamens emerge; stamens emerging from base, lateral stamens emerging throughout, alternates following within a few days, exserted well over pistil on fleshy, red-violet tinged filaments, retracting when anthers open; filaments ca. 5 mm long, ca. 6 mm wide, anthers pale yellow, ca. 0.6 mm long, 1.9 mm wide; the-cae oblong, scarcely divaricate; pollen yellow fading cream. 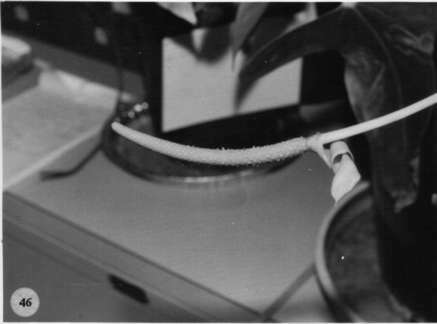 INFRUCTESCENCE arching-pendent; spathe usually absent; spadix 10-12(20) cm long, 1.5-3.5 cm diam. (5-6 cm diam. with berries fully emerged); berries ± obovoid to oblong-elliptic, rounded at apex, bright red (B & K Red 4/5); mesocarp translucent, juicy, with numerous raphide cells; seeds 1-2, green, streaked with purple, weakly flattened, 4.5-5 mm long, ca. 3 mm wide, 1 mm thick, enveloped in a transparent, amber, gelatinous sack. Figs. 42, 43, and 46. 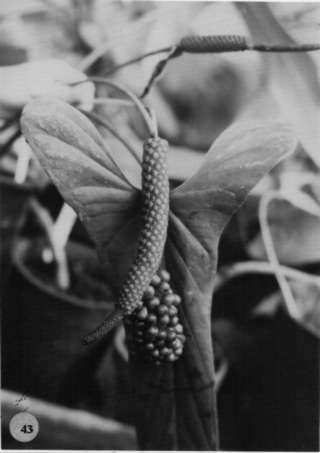 Anthurium chiapasense ssp. tlaxiacense is endemic to southern Oaxaca and has been collected at 1,400 to 1,500 m in seasonally dry forest. 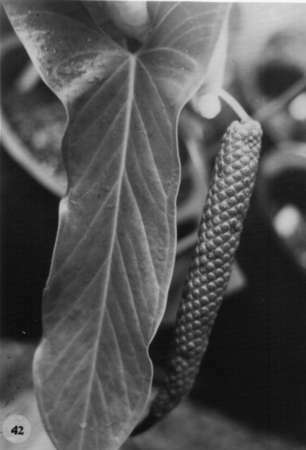 Anthurium chiapasense ssp. tlaxiacense is distinguished from ssp. chiapasense by its olive green spadix at anthesis and blades with the primary lateral veins prominently raised on the lower surface. It is recognized by its coriaceous, narrowly triangular-hastate leaf blade, dark green above and much paler and conspicuously glandular-punctate beneath. Mexico Chiapas: Mpo. Motozintla, 1750 m, 15.17N 92.21W, 8 Feb. 1990, Stafford et al. 322 (MO). Mexico Chiapas:, , Breedlove 24822 (DS).
. Mexico Chiapas:, , Breedlove 9990 (DS, MEXU). Mexico Chiapas:, , Breedlove 10365 (DS). Mexico Chiapas:, , Breedlove & Raven 13582 (CAS, DS). Mexico Chiapas:, , Breedlove & Raven 38172 (CAS, DS). Mexico Chiapas:, , Thomas B. Croat 40646 (MO). Mexico Chiapas:, , Matuda 25894 (MEXU). Mexico Chiapas: 900-1050 m, 15.27.N 92.38W, 21 August 1996, Thomas B. Croat 78481 (MO). Mexico Chiapas: 1180 m,, 12 July 1990, Hampshire & Garcia 1214 (MEXU). Mexico Oaxaca:, , Thomas B. Croat 45927 (MO). Mexico Oaxaca:, , Thomas B. Croat 46126 (MO). Mexico Oaxaca:, , Macdougall (MEXU).